Each year since 1985, the Harbin International Ice and Snow Sculpture Festival or simply known as the Harbin Ice Festival, held in Harbin in Northeast China turns the city into a magical, fantastic and icy wonderland, glittering with the sparkling magnificent ice sculptures that reflect the thousands of bright and colored lights that illuminate them and give them more depth at night. It is such a spectacular extravaganza that lasts for a month (or until the snow melts) starting on January 5. Even if you cannot get to see it (yet) you will be impressed by the creativity and grandeur of these ice sculptures, even if just in pictures. Ice sculptures are not uncommon and there are many ice sculpture festivals such as this in other parts of the world that experience heavy winter seasons. What makes the Harbin Ice Festival truly unique are its breadth, tradition, themes, activities and so much more. Its origin was from the traditional ice lantern show that became so huge it is now held in five places, each one showcasing different themes. In fact it is the largest festival of its kind in the world and had just celebrated its 30th year in 2013. 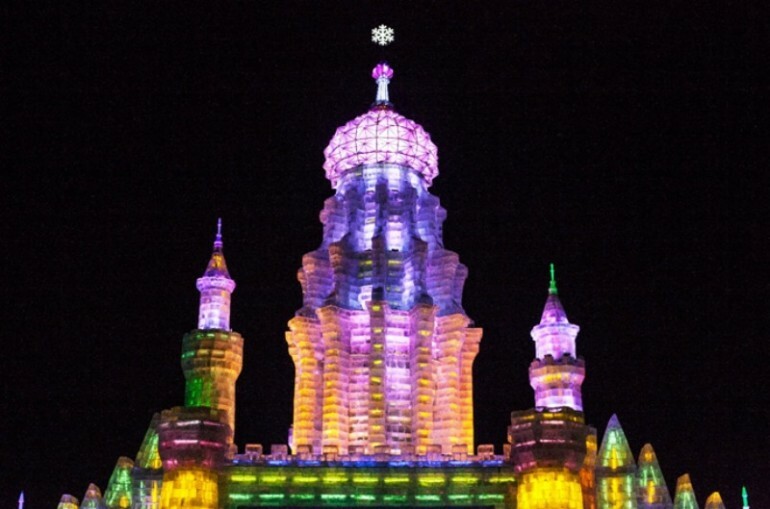 Harbin’s geographic location is very ideal as a stage for the world’s largest ice artwork fest. It is quite close to Russia and its winter winds come from Siberia, hence the amount of snow it annually receives and the arctic climate it experiences each year. However, the tradition of creating ice sculptures go back several years. Folks in the area traditionally created ice lanterns so they can have illumination when they work at night, including fishermen. However, what they do is just partially freeze water in a bucket, separate the two and punch a hole on top of the partially frozen form and pour out the remaining water. Placing a lit candle inside the hollowed out lantern protects the light from the wind, with the light getting brighter through reflection from the crystal clear ice lantern. It was an ordinary thing for the folks to do and even gave smaller ones to children as toys. With a country as old as China, it is not surprising that many traditions date a few centuries back. The first ice lanterns in the region of Harbin were created by rural folks around 1644, during the reign of the Qing Dynasty. From the simple bucket forms originally used, folks in the area began to use other molds to create various shapes, added ropes to them and placed them outside to display. Today, the centuries-old tradition is brought back to life, by combining artistic talents, modern tools and techniques, music and colored lights. So today, you can see fantastic replicas of architectural masterpieces around the world – temples, palaces and historic and monumental buildings. You can see highly imaginative depictions of everyday objects as well as imaginary and magical objects. You will see the creative skills of the craftsmen that race against time to create the displays, which on occasion may even defy gravity. 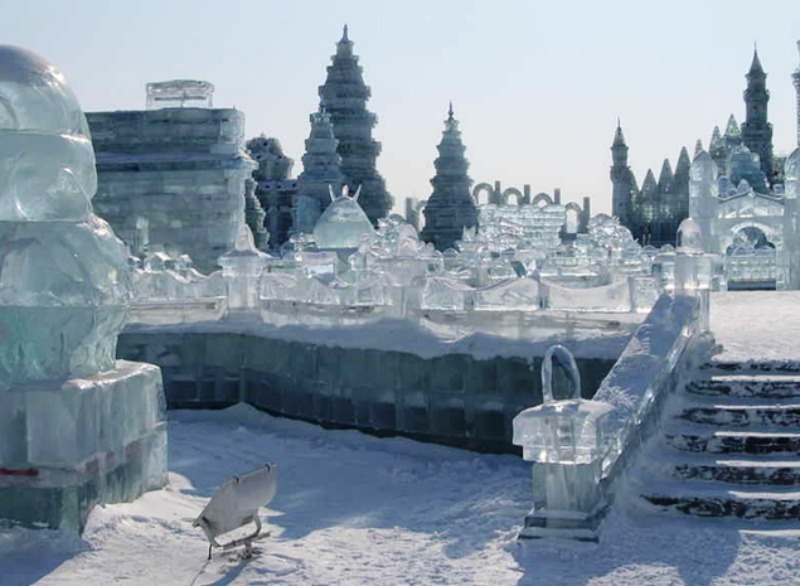 In Harbin, several places are dedicated to showcasing different sections of the ice festival. Even if you do not know anything about art, you will truly appreciate the beauty of these temporary artworks made of ice. At the Sun Island Park, visitors are treated to the Snow Sculpture Exposition – taking you to the world of snow. There is also an indoor snow and ice art museum here that is the largest in the world. It is already open to the public as early as November. At the Ice and Snow World, you will be in one of the largest ice architecture parks in the world. Here, the ice artworks consist of full size architectural pieces, with thick blocks of crystal clear ice taken from the Songhua River. Fantastic ice lanterns are what visitors will be treated to at the Zhaolin Park, which is touted as the one exposition area that should not be missed. Various themes are included in the annual attractions, so visitors could be treated to European folktales or classical works of Chinese masters. You will see mythical dragons to ferocious tigers and lions, to European-inspired churches, and objects from nature such as waterfalls, flowers and gardens, as well as important buildings. All of these are large-scale pieces, beautiful in its frozen, wintry white or crystal clear form during the day and amazing and glorious to look at during the evenings, with its myriad of colored lights and lasers. The Harbin Ice Festival is not just about art created using snow and ice, it’s about the exchange of culture at an international stage, as it becomes a gathering place for artists from Asia, Europe and North America.